Throughout the Old Testament, the stories, laws, and songs not only teach a way of life that requires individuals to be moral, but they demonstrate how. 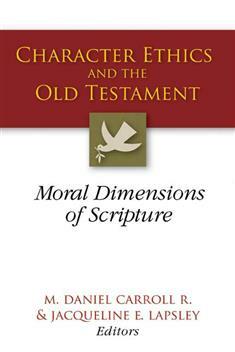 In biblical studies, character ethics has been one of the fastest-growing areas of interest. Whereas ethics usually studies rules of behavior, character ethics focuses on how people are formed to be moral agents in the world. This book presents the most up-to-date academic work in Old Testament character ethics, covering topics throughout the Torah, the Prophets, and the Writings, in addition to the use of the Bible in the modern world. In addition to Carroll and Lapsley, contributors are Denise M. Ackermann, Cheryl B. Anderson, Samuel E. Balentine, William P. Brown, Walter Brueggemann, Thomas B. Dozeman, Bob Ekblad, Jose Rafael Escobar R., Theodore Hiebert, Kathleen O'Connor, Dennis T. Olson, J. David Pleins, Luis R. Rivera Rodriguez, J. J. M. Roberts, and Daniel L. Smith-Christopher.